You do not have to confine yourself to a set of preselected courses that are designed to help incoming students fulfill general education requirements. As you select your courses, be sure that each one is on the right level for you (in some cases, one can substitute higher level courses for more basic ones). Once you’ve picked your program, you should attend each of the classes and decide whether the professor is someone from whom you can really learn. Often, there are many instructors teaching the same course, and using the drop/add process, you may be able to get a much better teacher. There is a lot of redundancy built into high school courses. Many classes go over what was done before, some classes are devoted to preparing for tests, and, once in a while, you don’t really do much at all. In college, it’s different. Professors have only 30 or 40 lectures in which to cover the subject, so they try to make each class count. If you miss more than a few lectures, you’re likely to miss out on content that will be difficult to fill in on your own. You need to be your own boss. Figure out when things need to be done and do them. The professor or teaching assistant might remind the class when papers are due, but no one will contact you when the deadline has passed and you haven’t handed in your work. You will also need to propel yourself to study. While a recent study shows that the average college student spends about 15 hours outside of class preparing, if you poll professors, you’ll find that they expect two hours of preparation for each class meeting. So, if you’re taking 15 class hours, the professors assume you’ll be spending 30 hours a week studying. That equates to four hours a day, if you’re doing your homework seven days a week. Exams in college are not 100 percent comprehensive — that is, the tests will not cover every topic or problem discussed in class. Instead, professors often select a representative sample of problems or topics, and test the students on only those. This is because professors are looking for depth of thought on some issue. When preparing for exams, then, it’s often a better strategy to prepare the central points in greater detail rather than going over everything superficially. College papers require analysis and research. In college, you may be asked to break down some issue into its parts and offer some evaluation of your own. You may be asked to consult original documents and scholarly sources and offer your assessment of them. This is in sharp contrast with what is expected of written assignments in high school, some of which require no more than a simple summary of what others have said on Wikipedia, and articles found on Google, newspapers, and magazines. Many colleges now encourage students to declare a major at orientation; this allows students to get started on some directed course of study, and it helps colleges manage course offerings. It may be a good idea to declare your major right away, especially if yours is a four-year program like pre-med, music, or a world language. In more cases than not, however, it’s better to wait until you’ve taken a few courses — especially upper-division courses in a given field — before you commit to a major. A reason students take so long in completing their degrees is that they successively change majors when they’ve picked wrong; and each time they pick, they’re committing themselves to 10 or 12 required courses. Professors are not distant figures whose job it is to give lectures in large auditoriums and spend the rest of their time doing research. In addition to those tasks, professors are also teachers, whose self-conception is often invested in whether students are doing well. They are often delighted to help students construct a paper or prepare for an exam. They also have office hours throughout the week so they may devote time to helping students. You should plan to visit each professor at least once during the semester. The office hour can be one of the few times at college for one-to-one engagement with a genuine expert in the field. Junior in high school? I bet you are looking at college websites and if you’ve gone on a college tour, you’ve come away with a college brochure. A college or university will emphasize its most attractive features – not its flaws. Want to look behind the scenes at what they don’t tell you? 1. How bad/good is the weather? You didn’t expect them to show you piles of snow on the cover did you? What you want to know is how bad is it? Even if you go to a warm climate, you might find it unbearably warm during certain months. You better be prepared for hotter than you expected in August when you move into Tulane University in New Orleans, Louisiana. Pack accordingly. 2. How much do you want to party? What distractions are there on/off campus? Fraternities/sororities or parties – finding a noise- and chaos-free area to study is critical. Be prepared to “turn off” such activities when necessary – like before your grades hit the academic warning level. 3. What is the area/town/city like? You won’t want to spend all your time on campus. You may need a break every now and then. Cruise community websites, chambers of commerce, and local arts and entertainment newspapers to get a sense of what’s happening near the schools you’re considering. It’s important to also check out – in person – the safety of the surrounding area. Even elite schools can be in poverty areas (Yale). 4. What supports are available at the career center? Does the career services match the economic climate? This says a lot about its commitment to students. Can it help you with internships (the key to jobs)? What percentage of recent graduates find jobs after college? It might not seem important right now, but you’ll thank yourself for putting in the research when the time comes for making career moves. Have you heard about gap year? This is a year that high school graduates may take to volunteer, travel, work, or explore interests or passions before starting college. Is gap year a good fit for you? Earnings: Positives: During gap year, you can work and save up money – to help with the costs of college. Negatives: jobs are scarce for college graduates – so make sure that you find employment beforehand. Responsibility: Positives: Working teaches important skills – managing money, learning to problem solve, and time management. Negatives: Consider whether you are ready to work long hours versus going to frat parties. These are the three categories of assistance you can receive for financial aid – grants (need-based) or scholarships (merit-based), work-study at the school, and loans. Some schools call grants “scholarships”, so be sure to ask the college to specify which it is, since the money you receive from a grant can vary from year to year. Remember that promises of financial aid are only for freshman and may not be continued for the other three years of college. More than likely, this aid will decline. However, schools know that after freshman year, you will probably not transfer out, therefore they aren’t worried about losing you to another school. Make sure that scholarships you receive from outside sources are used by schools to reduce your debt, instead of reducing grants. Loans increase the cost of college, even though schools may say that they meet 100% of of financial need. Dont rule out private colleges. They have huge endowments that may cover your financial need. 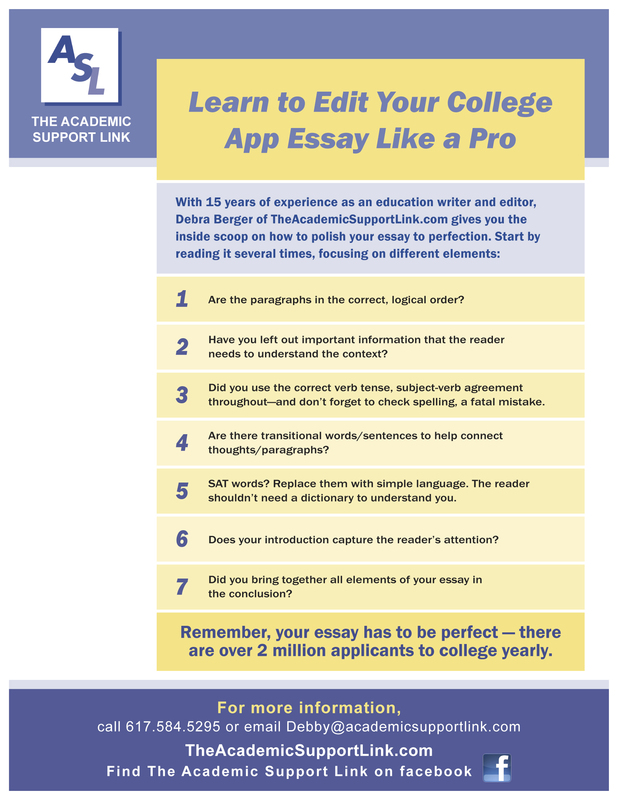 A client called me recently to help her daughter write the college essays. She wanted her daughter to start in the summer. Summer does seems like a great time to spend working on your essays. You are finally finished with school and activities are winding down. Unfortunately, the Common Application doesn’t come out until August. Why? Schools are still filling their ranks – accepting people off wait lists and getting organized for the next college application season. What to do? I advise students to do the following to get ready for the Fall Rush. Research the colleges and universities you want to go to: This means looking at their catalogue to find programs and majors that might appeal to you based on your interests in high school. In all likelihood, you will be asked to write an essay on this. Look at this year’s essay questions: Although these question might change for the fall, you will get an idea about what types of essays are required and maybe the kind of candidates they are looking for. For example, Tufts University’s supplement essay, “Describe your nerdy side”, reveals that this school wants creative students. Talk to friends/relatives who have gone to your desired schools: Getting as much information as possible about the colleges and universities you apply to will give you a good idea about professors, academics, and what life is like there. Resist the temptation to visit a college: You need to save your college tours until the fall. It’s important to see the school in “full swing” to really know if you want to apply. Honesty is the best policy on your college application. Don’t overstate grades, lie about participation in activities, or buy an essay on the Internet. If you have poor grades, time missed from school, a change in schools, etc., explain these briefly on the application – and be honest about it. Most colleges have an place on the application where you can talk about what happened. Don’t use the personal statement or supplement essay to discuss this, since it should contain only positive information. Some essays may be “reused” to apply to several colleges. However, make sure that you change the details and information. Ask someone to check your essay for these mistakes. Each application is different and unique, so make sure that you follow each school’s instructions exactly. Be especially careful about grammar and spelling mistakes. A college admissions officer will find the smallest error and know you didn’t take the time to check and re-check your application. What The Heck Is A Gap Year? Did you ever consider taking a year off after school? A gap year? This could be an opportunity to think about what you want to do in life – a chance to grow and become self-confident. You could also develop life skills needed for college or work. Research has shown that students who take a year off after high school are more likely to graduate from college in four years. Most colleges will be likely to defer a student’s admission and hold a place for him in following year’s class. What Do You Need To Know About Pell Grants? Pell Grants are targeted: In the 2010-11 academic year, approximately 74% of the nearly 9 million Pell Grant recipients had family incomes of $30,000 or less. Only 1.9% of recipients came from families with incomes exceeding $60,000 who typically have multiple children in college. The program can’t keep up with the cost of college: Since 2008, annual spending on the Pell Grant program has more than doubled, to nearly $40 billion, and with the Obama administration and Congress, the maximum grant has jumped from $4,731 to $5,550 (and is scheduled to rise again to $5,635 in fiscal year 2013). Despite these increases, the maximum Pell Grant is expected to cover less than one-third of the average cost of attendance at public four-year colleges next year. Increasingly, colleges are not doing their part: The country’s public and private non-profit four-year colleges are now spending a greater share of their institutional aid dollars on trying to attract the students they desire than on meeting the financial need of the low-and moderate-income students they enroll. While many schools use institutional aid to attract the best students in order to raise their U.S. News & World Report rankings, others are using these funds to attract wealthy students to maximize their revenue. Pell Grant recipients take on more debt than other students: Education Department data shows that Pell Grant recipients are “more than twice as likely as other students to have student loans (63% vs. 30%),” Amont those Pell Grant recipients who graduate from four-year colleges, nearly 9 out of 10 have student loans, with an average debt of $3,500 more than their higher income peers.